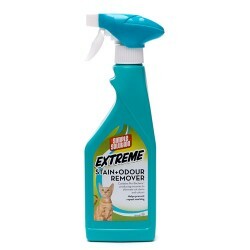 Product Details-Capacity-500ml, Suitable for Cat, Use-Stain and Odor Remover. Product Information-Simple Solution stain and odor removers are the number 1 performing product available, developed to use pro bacteria and enzyme technology to effectively and hygienically remove organic pet and household stains. Simple Solution Cat Stain and odor Remover is the only formula which contains both Pro bacteria and enzymes which effectively remove stains and odors. Simple solution is completely safe for use around pets and children. The formula has been specifically designed to clean mess from pets such as vomit, urine and farces, completely ridding your home of odors and discouraging pets from repeat marking. Safe for use on carpets. Upholstery, bedding, clothing and any other water safe surfaces.